The discovery made me very happy. The cover doesn’t provide any clues, and none of the reviews I read mentioned it, so it’s one of those details that’s dependent on word-of-mouth if readers are to learn about it in advance. The other detail of note is the story takes place in the far future, at a time when space travel is possible. It’s a multi-species, multicultural type of setting. 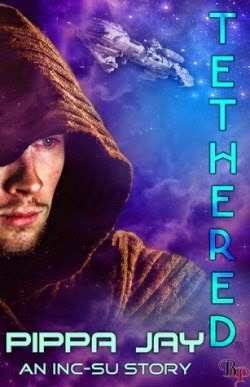 So when I read another sci-fi romance after TETHERED and encountered an all-white cast of characters in a far future setting, it was very jarring (I’m not going to mention the title because it’s hardly the first of its kind. But it was published in 2015). The opportunity existed to at least make the background characters people of color, but the story didn’t even offer that much. Subsequently, that aspect of the worldbuilding rang hollow to me. Why is white the default? As author Suleikha Snyder and others pointed out in a discussion on Twitter, even something like an all-white member football team isn’t plausible or the norm *right now. * Therefore, I have a difficult time suspending disbelief for a story with all-white characters in an SFR. My community is diverse. My friends are diverse. The TV shows and films I watch are diverse. So I wince pretty hard when SFRs I read reflect neither reality nor my other types of entertainment. Some authors and readers are concerned about the plausibility of science fictional elements in SFR and that a basic level of believability is crucial to the stories, especially if readers are to take them seriously. That’s a valid concern, but what about plausibility when it comes to the characters’ races? Here's the thing: an all-white cast in a far future setting is fraught with plausibility issues. A white default setting will yank me out of a story faster than any fantastical elements ever could. Should SFR really have more aliens or “Other” characters than characters of color? Are we really saying we can relate to aliens more than people of color? Stories that lack people with a variety of skin tones send the message that readers of color aren’t wanted and aren’t worth being represented (which is ironic given this particular news: The Most Likely Person to Read a Book? A College-Educated Black Woman). Even STAR TREK back in the *1960's* explored issues of race and diversity. Science fiction romance can do the same, and do better. To authors who have science fiction romances in progress or in the planning stages: please take a fresh look at your character choices and consider diversifying your cast if you haven’t already done so. Race, sexual orientation, disability--it's all good. Let's make inclusiveness the new default. Thank you.